Pebble Beach has been a tourist destination since the early twentieth century when coastal lots cost as little $500, and visitors arrived in horse-drawn buggies. What exactly is Pebble Beach? Pebble Beach is an unincorporated community between Monterey and Carmel, California. It includes the Pebble Beach Resort and an exclusive residential community where the home prices soar into the tens of millions. Pebble Beach's reputation for outstanding natural beauty and elegance is unparalleled, and most people like it. It's popular with golfers and others who want to play while surrounded by beautiful scenery. It's also a perfect place for a relaxing or romantic getaway, an excellent meal, or just a scenic drive. If you want to hike and explore the natural surroundings, you'll be better off at Point Lobos just south of Pebble Beach. Pebble Beach is also a little upscale in their style of dress. If you think dressed-up is putting on a clean but a faded souvenir T-shirt and frayed shorts with your flip-flops, this may not be the place for you. It's easy to love Pebble Beach for its natural beauty, ambiance, and high-quality accommodations. Sunday lunch at Roy's Restaurant at the Inn at Spanish Bay is a particular favorite thing to do. The only downside is the price. If you're on a limited budget, you may have to make do with a drive-through and a picnic at the beach. The weather at Pebble Beach is best in spring and fall, with the best chance for clear skies. Like much of the California coast, it's likely to be foggy in summer. The misty fog lends an air of mystery but might dash your hopes of a sun-drenched golf game. During big events like the ones listed below, the hotels may sell out, and things can get crowded. Unless you're attending those events, you'll be better off to go some other time. If you're staying in one of the Pebble Beach Resort hotels, you can reserve two complimentary hours in one of their Lexus test-drive vehicles and do the 17-Mile Drive in style. Most of the things to do around Pebble Beach center on the water. Take a walk. Oceanfront paths run along many sections of the coastline. The trail that runs from the Inn at Spanish Bay to Bird Rock is especially scenic. The Spa at Pebble Beach offers an excellent range of treatments, and you can stay as long as you want afterward to enjoy the Jacuzzi, sauna, steam and inhalation rooms. To connect with your surroundings, try their Lasapa Lelima treatment, a cleansing/bathing ceremony inspired by the native Esselen people. They use locally grown coastal and white sage, elderberry, and blue cornmeal. Golf courses at Pebble Beach include the Pebble Beach Golf Links, rated one of the country's best public courses, along with three other outstanding links. You can also take advantage of their Golf Academy lessons and classes to improve your game. Resort guests can reserve tee times ahead of time, but drop-ins can only do it 24 hours in advance. The Pebble Beach Equestrian Center offers daily trail rides (reservations required). A sunny afternoon is an especially nice time to enjoy the outdoor patio at the Inn at Spanish Bay. Arrive in the late afternoon and linger until the strolling bagpiper has blown his last note. Pebble Beach Pro-Am Golf Tournament is held annually in February. With its combination of great golfers and popular celebrity participants, it draws large crowds. U.S. Open golf tournament is held at Pebble Beach periodically. It's scheduled there next in 2019. Pebble Beach Concours d'Elegance happens every August. This event features classic automobiles such as Bentley and Bugatti, displayed on the lawn of the main lodge, along with concept cars and high-end luxury autos. The Pebble Beach Food and Wine Festival occurs in April. Rockstar chefs, respected winemakers, and lots of food-loving fans get together for this event. You could stay somewhere nearby and drive to Pebble Beach. You might save money by doing that. But if you're spending the weekend at Pebble Beach, you really need to stay put and let it all sink in. 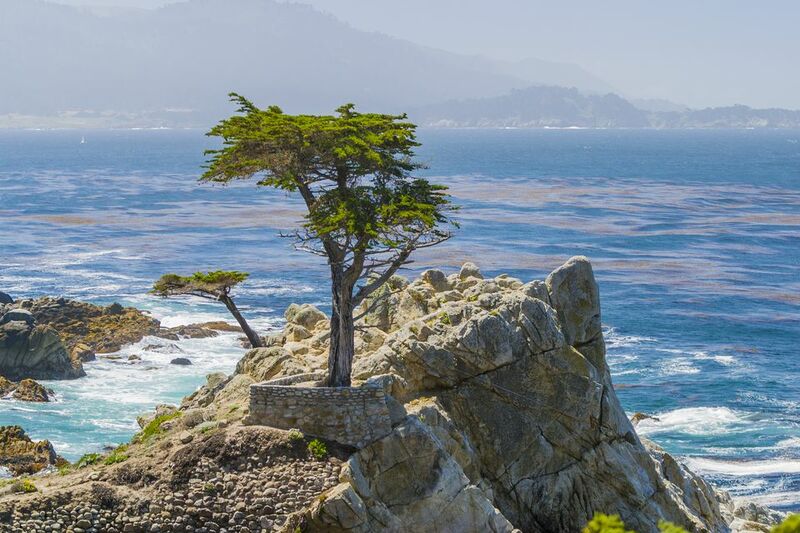 You'll find all your options at Pebble Beach and in the nearby area of Monterey. The only way to get into Pebble Beach is by taking the 17-Mile Drive.